“The best kind of learning does not train you to win. It teaches you to ask what winning might mean. It cultivates curiosity and boldness — whether you’re tracking an elusive gene or boarding a bus in Mumbai — and it gives you a new capacity to act, despite the risks," said President Drew Faust during the Baccalaureate Service for the Class of 2013. Drawing inspiration from the first responders to the Boston Marathon bombings, Harvard President Drew Faust urged graduating seniors on Tuesday to “run toward” challenges, passions, and places in life where their help is needed, despite the risks that might entail. Faust made her comments during the annual Baccalaureate Service in the Memorial Church. 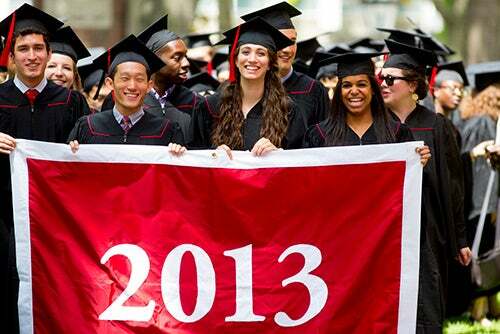 The Baccalaureate Service dates to Harvard’s earliest days and occurs early in Commencement week. Restricted to members of the graduating class, the service is intended as a farewell to seniors from the president and clergy, in a less-formal setting than that on Commencement Day. The Baccalaureate also allows members of the Class of 2013 to don their caps and gowns before graduation. Class members lined up in the Old Yard in front of Holworthy Hall before 2 p.m. and processed past University Hall and the John Harvard Statue and into the church. Presided over by Jonathan Walton, the Plummer Professor of Christian Morals and Pusey Minister in the Memorial Church, the service featured readings from several holy books, including the Quran, Hindu scripture, the New Testament, the Hebrew Bible, and the Analects of Confucius. In his introductory remarks, Walton reminded students that, although they are about to achieve a goal long sought, their graduation is also a beginning, after which they will face more opportunities to learn as they meet the challenges of the world beyond Harvard. In her speech, Faust extolled the class’ virtues as she reflected on events of the past four years. The Class of 2013 was the first enrolled after the global economic crisis that “rattled almost everything,” the first to experience Harvard’s new academic calendar, and the most socio-economically and internationally diverse class in Harvard’s history, representing 84 countries. Faust also mentioned the academic integrity case that roiled the campus in the fall of 2012, reflecting that the incident raised hard questions about trust, success, and integrity. She added that an attitude of winning at all costs can make life into an “endless string of contests” that loses sight of a larger purpose and the sense of what success really means. In thinking about that question, Faust sought to draw meaning from the carnage of the Marathon bombings and the split-second reaction of many people, including police, medical personnel, and bystanders, to lend a hand instead of dashing to safety. While not everyone is ready to run toward an explosion, Faust said, everyone is suited to and needed for something, though that may mean leaving what’s safe and certain for the unknown. It also means running not just toward your dreams, but also toward where you can help, Faust said. “Living a life of running toward is what a liberal arts education has helped prepare you to do,” Faust said. Senior Sachin Patel said he thought that Faust’s message spoke to the experience of the Class of 2013. Senior Juhi Kuchroo said she was glad that the Baccalaureate Service was inclusive, with readings from different faiths. Faust’s message, she said, resonated with her.